Grinding teeth at night is called nocturnal bruxism. The distinction is made because for some people the habit goes on during the day, in which case it would be called diurnal bruxism. Some people are unaware that they are clenching their jaws or working their masseter muscles. It is a movement normally associated with chewing. No one knows exactly why the movement becomes an unpleasant habit. People who are unaware that they have bruxism might notice some of the symptoms it can cause. Examples of symptoms that bruxism can cause include earache, jaw pain, neck pain, headache and ringing in the ears. Dental problems, such as a loose tooth, may be the first indication that habitual teeth grinding is going on. A dentist may notice things like erosion of tooth enamel on a regular visit and counsel the patient about the possible cause. Teeth grinding at night can increase the risk of tooth fracture, dental decay and gum recession. In chronic, long-term cases, the problem can lead to arthritis in the joints responsible for opening and closing the jaws. Dysfunction of the joints may be the long-term effect. In order to diagnose the condition and the severity of it, sleep labs can be used. It is a common sleep disorder and is sometimes involved in insomnia or other sleep disorders, such as apneas. So, a complete evaluation of a person’s sleep habits is often the best course of action. There are methods for treating bruxism. Medications, behavioral modification and dental guards are among the most common. A recent study concluded that low-tech treatments like dental guards are effective more than 90% of the time. The researchers concluded "there is no need for invasive, irreversible, expensive or high-tech treatments for the majority of patients." 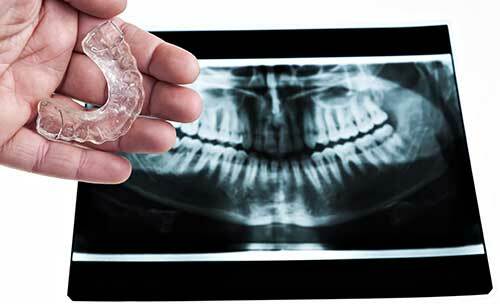 If a damaged tooth or two must be repaired using crowns or inserts, most dentists will fabricate a dental guard to protect the repairs and prevent further damage that could be caused by grinding teeth at night. Several studies and case reports indicate that magnesium supplementation may be helpful, even if there is not an obvious lack of magnesium in the person’s diet. Magnesium supplementation is often recommended for facial tics and other uncontrollable muscle contractions. It is helpful in restless leg syndrome, for example. A combination of magnesium and calcium could be helpful in two ways. First it may reduce the teeth grinding at night. Second, it may help to reduce tooth loss by ensuring that the nutrients necessary for tooth building are present in the bloodstream. Stomach problems, such as acid reflux, have sometimes been identified as the root cause of bruxism. Calcium supplementation is helpful for acid reflux, as well. Overall, a good multi-vitamin and mineral supplement is never a bad choice. If it provides no benefit, it will certainly do no harm. Some of the “high-tech” treatments can do more harm than good. For example, Botox injections are sometimes recommended for teeth grinding at night. The injections can eventually cause permanent damage to the jaw muscles. Other serious side effects, including death can accompany the Botox choice. Dental guards and dietary supplements are much safer choices to deal with grinding teeth at night. There are some other safe home remedies you can try. Eating something chewy like an apple before bedtime can give the jaws enough exercise to help them relax a little bit. Stretching the mouth wide open and holding the position for a count of 10 might also help. You can repeat the stretching exercise several times before going to sleep, as long as it does not cause pain. Other safe solutions for grinding teeth at night include the use of massage, a warm bath, a cup of warm milk or deep breathing exercises to relax your entire body. If you are relaxed, you are less likely to clench your jaw.